-Lather and apply with a shaving brush for best results. -Try shaving after a shower - it will help to soften your facial hair making shaving easier. 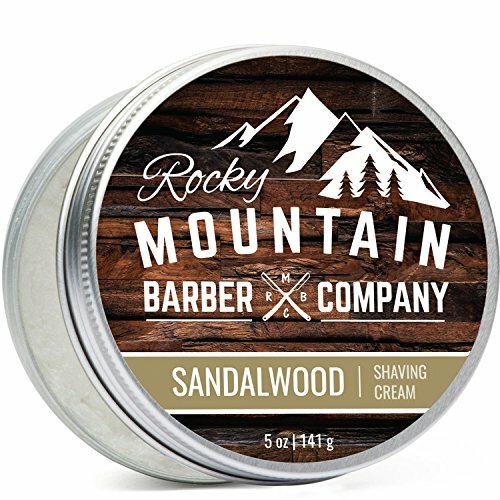 -Pair with Rocky Mountain Barber aftershave for the complete shaving experience. NATURAL INGREDIENTS - Includes naturally derived ingredients making it perfect for all skin types . REDUCE IRRITATION - Contains skin calming coconut oil & glycerin to help moisturize the skin. MADE WITH ESSENTIAL OIL - Contains Sandalwood essential oil to help sooth sensitive skin. MADE IN SMALL BATCHES - Means a fresher shaving cream with fresher ingredients. VERSATILE LATHER - Can be applied with or without a shaving brush.